Within UWM’s 14 schools and colleges, you will likely find the area of study that you are seeking. As a large research university located in an urban environment, UWM supports a student community that is made up of about 23,000 undergraduate students and 4,900 graduate students. As part of this community, more than 1,700 international students call UWM home. UWM is committed to global engagement and places value on diversity in all of its definitions, including who we are, how we think, and what we do. UWM is a public research university in the University of Wisconsin System and located in Milwaukee, Wisconsin. UWM offers undergraduate and graduate students the opportunity to live in on-campus housing. UWM has English as a Second Language Programs. Click here to learn more about UWM. Milwaukee is the state of Wisconsin’s largest city, offering a unique environment that combines a thriving urban center with a small-town atmosphere. Milwaukee is about 90 miles (144 kilometers) from Chicago, Illinois, which is the 3rd biggest city in the U.S. by population. Students receive a bus pass for unlimited free rides on Milwaukee’s public-transportation bus system. 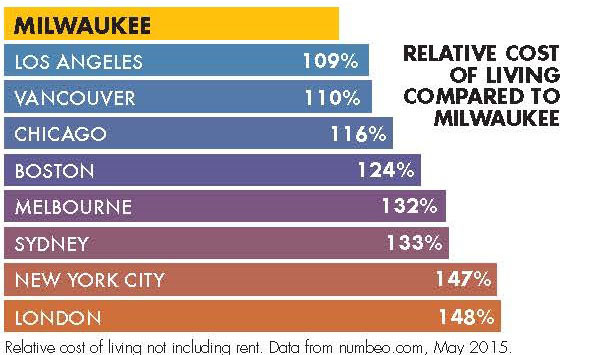 The cost of living in Milwaukee is significantly lower than in cities of coastal states. Milwaukee is home to six Fortune 500 companies. Click here to learn more about Milwaukee. The cost of classes for out-of-state students for one academic year* is about $20,000 for undergraduate and $25,000 for graduate students. In general, new students who have English proficiency and maintain steady and successful progress towards their degree will need 4 years to earn a bachelor’s degree, 2-3 years to earn a master’s degree, and 5 or more years to complete a doctoral (PhD) degree. The estimated living expenses (which will vary depending on your accommodations and food arrangements) for one academic year are about $12,000. The cost of health insurance for one academic year is about $1,430. Compared to coastal cities (e.g., Vancouver and Los Angeles) and major metropolis cities (e.g., New York, Chicago, London…etc.) living in Milwaukee costs much less. *An academic year means fall (September – December) and spring (January – May) semesters. All new undergraduate international student applicants who apply for the fall semester are considered for the UWM Excellence Scholarship. The UWM Excellence Scholarship is a competitive, merit-based scholarship. The UWM Excellence Scholarship is a one-time award given during the first academic year. In 2015, awards were offered to seven admitted students and the average award was $3,000. Many graduate programs offer graduate students assistantship awards and chancellor awards. There are three different types of assistantships at UWM: Teaching, Research, and Project. An assistantship of 33% or higher includes tuition remission, health insurance, and a stipend or salary. Check the webpage of your academic program to see whether the program offers awards. If you can’t find it on the program’s webpage, email the graduate program representative. For a bachelor’s degree program, high school graduation (or the equivalent) is required for admission. Admissions coordinators carefully consider your academic preparation, as evidenced by the pattern and rigor of your high school coursework, class rank (if available), overall grade point average (GPA), and grades in specific courses related to your intended major at UWM. Students who have lower than a 2.0/4.0 GPA (in study at high school or another university) are not admissible. Some majors require higher GPAs (e.g., Architecture, Engineering, and Computer Science) and may also require additional materials and test scores (e.g., ACT or SAT). Master’s degree programs require a bachelor’s degree (or the equivalent) for admission. Doctoral degrees programs may require a master’s degree for admission but some programs admit students who only have bachelor’s degrees. Competitiveness in the admission process for a master’s or doctoral degree program varies widely depending on the academic program. Click here to learn how to apply to a degree program at UWM.